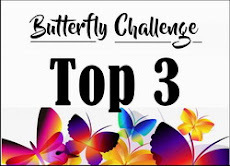 Butterfly Challenge: #114 Spin The Wheel with the Letter I. 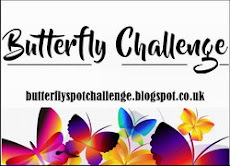 Happy New Year to you all and welcome back to the Butterfly challenge. Thank you all for playing along with the last challenge. Winners results for #113 are published in the post below. Make sure you check back as it could be you. Can I please ask that Winners do acknowledge their prize in the comments on the Winners post as well as emailing their details to me. This way I will know to expect an email. Please state if you are only playing for fun so that it gives someone else the chance to win. Challenge is for 2 weeks. #114 Spin The Butterfly Wheel with the letter I. Imperial Purple/Iceburg/Ivory/Invitation/Include a Die Cut/Image can be Digi or a Stamp/Butterfly. Second card uses Imperial Purple/Ivory/Butterfly. Well, shock horror, Mrs A. Im joining in again! Twice in two challenges! Happy new year too and every blessing for 2019! Wow its weird writing that! Guess 2020 will be stranger! Today I am joining the cahllenge and used ivory details and some diecuts! My thumbnail has a serious dose of wishy-washiness! I think it's because I took the photos yesterday when everywhere was so dark and gloomy I had to use electric lighting and flash. If only the weather had been like it is today with lovely bright sunshine! I am fiiiiiiiiiinalllllly back to play along out in the butterfly garden!!! I have missed so many challenges and didn't even manage a fairy card for last month. But here I am and hoping to do better in the New Year!!! Thank you for another lovely challenge. Here as promised .. .. didn't quite make the 7. Didn't want to risk my wedding couples seeing it and thinking they could order 40 odd!! LOL!! Thank you for the inspiration. Love the colour combo. Beautiful creations Mrs A! I especially like the large butterfly one! 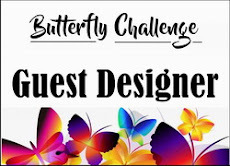 Just discovered your challenge blog. I love the use of the letter for a challenge like this. I look forward to playing along again. 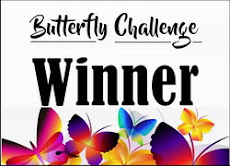 Thanks for the grand challenge with wonderful prizes too!